Piedāvājam iegādāties AOC 23.8" monitoru ar FHD 1920x1080 izšķirtspēju. Description - The AOC 90 series (Pro-line) monitors the AOC I2490VXQ, combining attractive design and functionality for business users and pros. The IPS 23.8 "panel gives a clear and vibrant Full HD image for viewing at an angle of up to 178 °. 90% NTSC and 100% sRGB widescreen are combined with faithful, uniform color reproduction for photo / video editing. 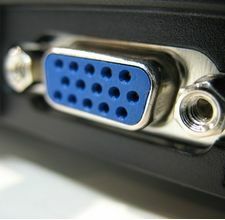 The HDMI, DisplayPort and VGA inputs allow for a variety of connectivity options. Users who spend hours in front of the monitor will appreciate the Flicker-Free technology, which reduces flicker by adjusting the brightness of the screen in DC, and the Low Blue Light mode, which reduces the harmful wavelength of blue light. The energy-saving I2490VXQ also features Energy Star, EPEAT and TCO. It also features an Off Timer that turns off the monitor after a specified period of time, as well as Eco-mode, which adjusts the screen to various types of content (Text / Internet / Garage / Film / Sport) to reduce power consumption. The I2490VXQ monitor shows that office monitors can also be elegant.